Dragon Branch promises to help users find the necessary information very quickly and even enhance web browsing experience. Unfortunately, it does not seem to be true because it does not do anything beneficial when it enters the system. According to our specialists, this program has been published in order to show ads only because it starts displaying them after the installation. As this software shows ads only, it is classified as an advertising-supported application by our researchers. They do not recommend keeping such programs because they might cause harm to your PC very quickly. If you are not sure how to delete Dragon Branch, read this article from beginning to end. Dragon Branch has replaced Positive Finds, Strong Signal, and Roaming Rate, but it still acts exactly like aforementioned programs. It means that it will generate video ads, in-text ads and links, web-browsing related ads, interstitial ads, transitional ads, and full-page ads. Even though advertisements do not seem harmful, you should still be very careful because unreliable links that might be embedded into them might take you to various corrupted websites. We cannot tell what you will find on them because we do not know. Actually, even the publisher of Dragon Branch cannot tell you what you will find on the websites associated with its ads. It means that there is a huge possibility to encounter malicious software. Keep in mind that malware might enter your system very quickly and you might not even notice that. Even though Dragon Branch has a very attractive website, it is impossible to download it from there. It does not seem that you have downloaded and installed this adware yourself; however, it is very likely that you have agreed to the installation of this adware without even wanting that. In most cases, users do that without even knowing that because they simply do not pay attention to the setup wizard. You have to be more attentive if you do not want to allow malware to enter your system. In addition, our security experts think that you should acquire a security tool. You should remove Dragon Branch not only because it is a very annoying program, but also because it might cause harm to your PC. Luckily, you can remove this program yourself rather easily because it can be deleted via Control Panel. 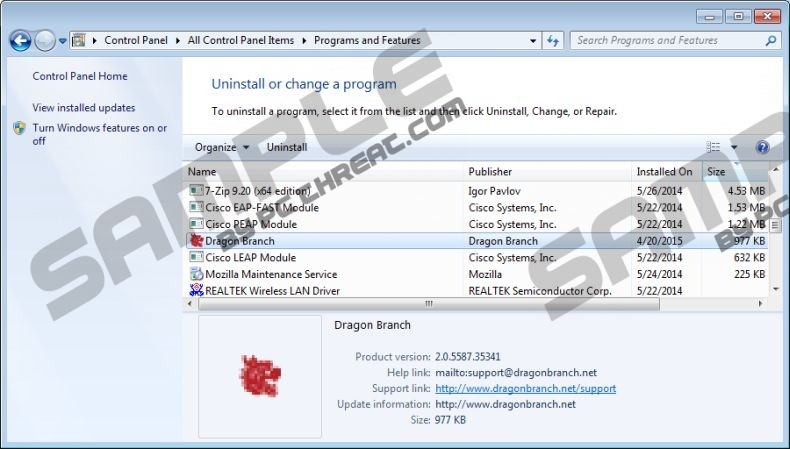 As there might be other untrustworthy programs installed on your system, make sure that you scan your PC with a trustworthy scanner after the manual removal of Dragon Branch. Locate Control Panel in the menu. Locate the software that you want to remove. Click on it and then delete it. Quick & tested solution for Dragon Branch removal.